The new, brighter, LEDs offer virtually limitless colour possibilities, from bold solids to subtle pastel shades, thanks to digital dimming technology. Each individual spot can be independently angled with separate tilt and swivel movements and the whole product has a tough, yet lightweight, metal construction. 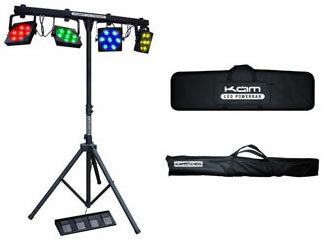 The LED Powerbar is supplied with a padded carry-case, tripod stand and a foot controller. The unit features a host of pre-programmed chase patterns and is also compatible with DMX512 via 15 control channels. The Kam LED Powerbar is available now with an SSP of £589.95 (inc V.A.T).